The Galaxy S Plus runs Android 2.3.3 with the custom TouchWiz topping. 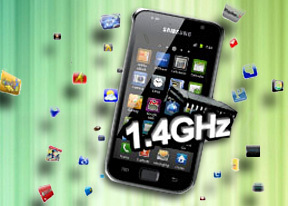 This is not Samsung's latest launcher we saw on the Galaxy S II but the older version 3.0. There isn’t a whole lot of change compared to the original Galaxy S – which by the way has already received its Gingerbread upgrade too. To get an idea of how the Galaxy S Plus handles, check out the user interface video demo below. We’ll be reusing texts from past reviews but you should rest assured that we’ve updated all the content to match the Galaxy S Plus specifics. The homescreen fits up to 7 panes, which can be managed quite easily. A pinch zoom on screen takes you to edit mode where you can add, remove and rearrange the panes as you see fit. The notification area which you pull down from the top of the screen has seen some visual changes since the Gingerbread update but no new features. You can turn Wi-Fi, Bluetooth, GPS, Sounds and auto-rotation on and off. You also get information about active connections and missed events. The main menu is basically unchanged from the original Galaxy S, except that the icons have lost their color backgrounds to look a lot less iPhone-like. The menu is side-scrollable, with a 4 x 4 grid of icons on each page, the four docked icons at the bottom visible at all times. You can also opt for a list view. Rearranging apps is very easy to – in edit mode just drag an icon where you want it placed. In terms of wallpapers you get the standard gallery with a collection of live and static wallpapers that have seen no changes since the Galaxy S days. Some of the live ones look pretty cool on the SuperAMOLED display but they do tend to drain your battery. Samsung have long added a task manager to their TouchWiz launcher. Complete with a homescreen widget that shows the number of currently active apps, it saves you the need to install a task killer on your own. Performance-wise the Galaxy S Plus is fluid and very responsive and we experienced no lags whatsoever. You can scratch that one on the 1.4GHz processor as it handles the UI without a glitch. In terms of synthetic benchmarks the Galaxy S Plus is way ahead of the original 1GHz-running Galaxy S. Using the 1.4 GHz Qualcomm MSM8255T Snapdragon chipset, the retail version of the Galaxy S Plus outperformed the original Galaxy S in almost every benchmark we ran. It only fails to prevail in the GPU benchmarks where its outdated Adreno 205 falls short of the PowerVR SGX540 in the Galaxy S.
Here are the numbers - Linpack, BenchmarkPi, Smartbench 2011 and Neocore. 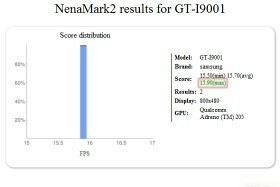 Check out the Quadrant score where the Galaxy S Plus slightly outscores its predecessor. And now let's check out the GPU showdown. The Galaxy S Plus is running on the Adreno 205 GPU while the original Galaxy S has the PowerVR SGX540 inside (the iPhone 4, for example, is running on the older PowerVR SGX535). We used Nenamark 2 for this showdown. 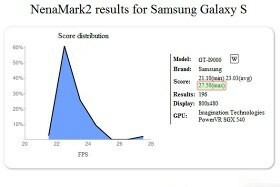 The Galaxy S Plus got a score of 15.9fps (frames per second) while the original Galaxy S outscored it with 27.5fps. So as you can see even if the 1.4GHz Snapdragon processor is better in overall performance over the 1GHz Hummingbird of the original Galaxy S, the GPU performance is in favor of the latter. We should clarify that both the original Galaxy S and the Galaxy S Plus are running on the latest Android Gingerbread version 2.3.3. A faster GPU is better for playing high-quality games and videos in the browser so it's definitely a plus - just not for the Galaxy S Plus.